Pedernales Falls State Park is located in Blanco County about 35 miles west of Austin and nine miles east of Johnson City. 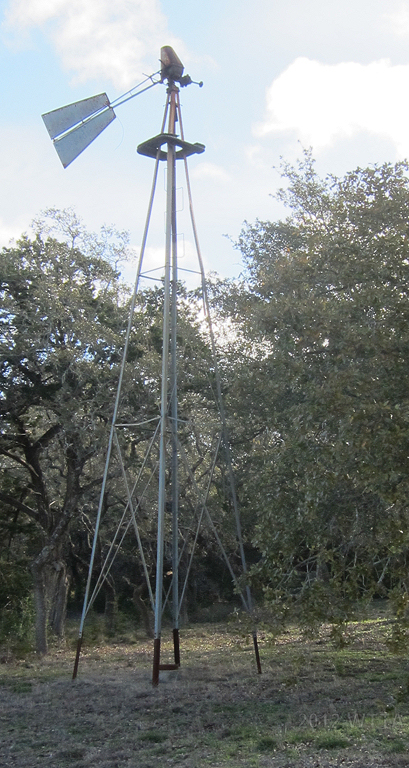 From 290 head north on Ranch Road 3232, turn right on County Road 201 (Pedernales Falls Rd. ), then take an immediate left on Park Road 6026, you will see the park sign. Park Road 6026 will take you to the park entrance. From Johnson City off of 281 head east on Ranch Road 2766 ((Robinson Road), this will turn into County Road 201 (Pedernales Falls Rd. ), pass Ranch Road 3232 on your right, then take an immediate left on Park Road 6026 where you will see the park sign. This road leads to the park entrance. Once entering the park headquarters gate/pay booth continue down the main park road and look for a sign to your right labeled “Bird Blind Parking”. 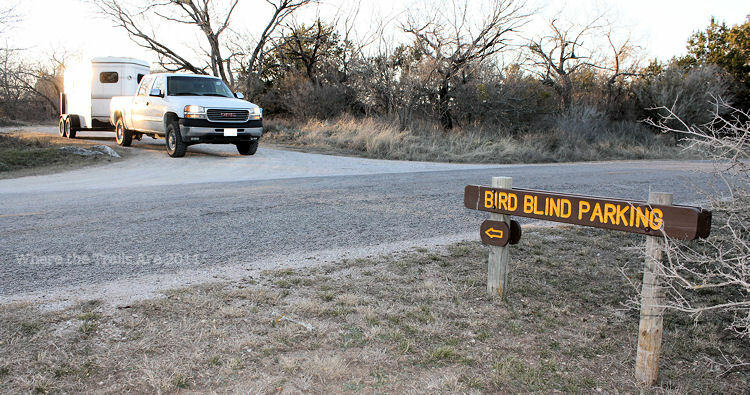 At this sign turn left into the Bird Blind Parking area and pass it. Continue down the road into the equestrian parking area. There is no sign marking the equestrian trail head parking. This sign leads to the equestrian trail head / parking area which is not labled. The truck is exiting the equestrian parking area. $6.00 per rider per day. 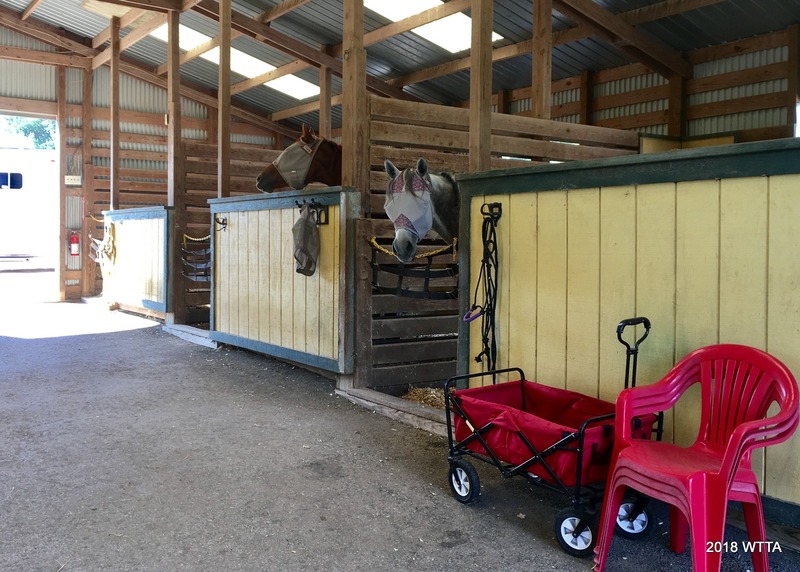 At the equestrian trail head / parking there is a chemical toilet, running water, a wash rack, hitching posts, a water trough, and two covered picnic areas. The parking area provides enough space to accommodate large rigs if it is not too crowded. Picnic tables and hitching post. According to the park website there are approximately ten miles of trails. However, it seems additional trails/loops have been added. A total of four loops; North Loop, Duck Lake Loop, Short Loop, and the longest, South Loop, make up the equestrian trails. If you ride the Short and South Loops it is approximately a 13-14 mile round trip, however if you just stay on the Short Loop it is approximately 6 miles. Take the trail entrance/exit on the west side of the trail head and turn left to get to these trails. The Duck Lake and North Loops combined are estimated to be approximately 3-4 miles. To get to these trails exit the trail head the way you drove in by the chemical toilet and then go to your left. If you have more accurate mileage for this park please send it in. At the park entrance gate, be sure to ask for the map which has the equestrian trails marked on it. It will be very similar to the map shown below. Trail Users: Equestrians, bikers, and hikers. Everyone yields to the horse. 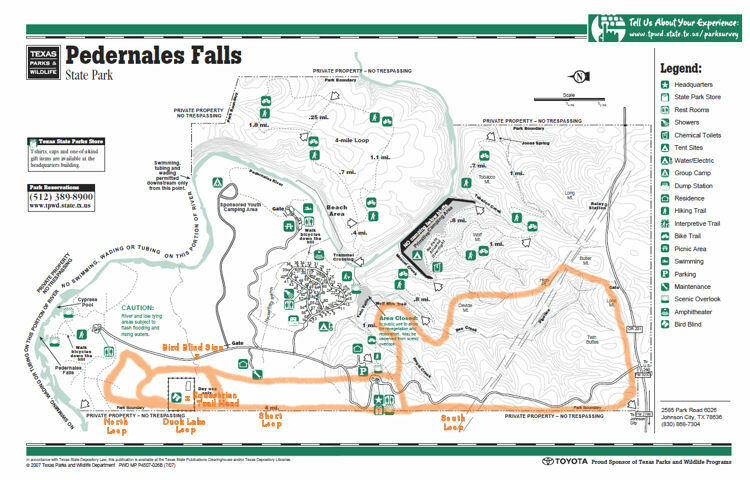 Terrain: Pedernales Falls is another great example of the beautifully rugged Texas Hill Country. The terrain is rocky so shoes or boots are recommended. Some parts of the trails are open while most of the trails are wooded. There are mild grade increases and declines as well as a few mildly steep step downs or ups at the creek crossings. Overnight equestrian camping is allowed but you do have to rent out the entire equestrian group camp site (different location than the equestrian day use area). There are paneled stalls, a water trough, and a portapotty. Please call the park for more information. Gary and Priscilla Robichaux, Tommy Robichaux, Wren Winfield, Carol Grosvenor, Kate Kuenstler, and Lynn Kuenstler. Cowboys Under The Stars, is one of the park’s interpretative programs hosted by Lynn Kuenstler, State Park Police Officer. The intention of this program is to inform visitors about the park’s history, land uses, and to camp like the cowboys did; with only what you pack out on your horse. Luckily, Lynn does allow participates to bring along a few comforts (tent, sleeping bag, your horses’ s supplies, etc..) to be delivered to the campsite, so long as it all fits in a truck bed. 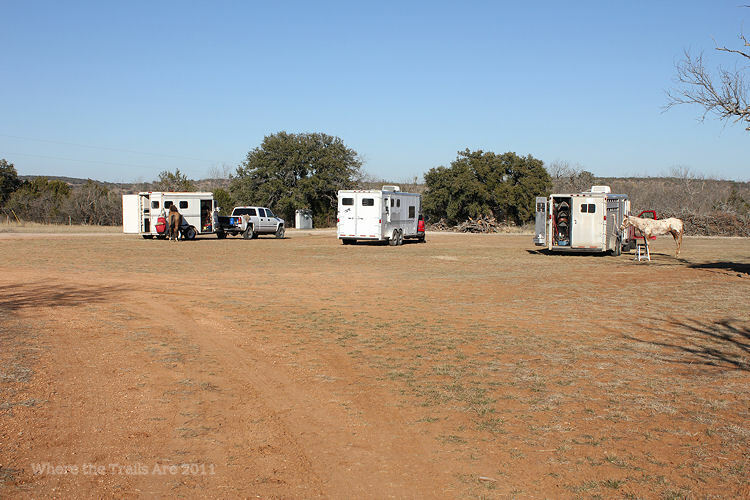 This is the only time riders can camp overnight and ride off of the marked equestrian trails. This is a very affordable program as you pay the normal park camping fee of $10, the $5 day use fee, and everyone contributes for the food and hay expenses. The Cowboy Under The Stars Program is offered three or four times per year from October until about April, before the Texas heat becomes too oppressive. Lynn can take up to about 12-14 riders at one time for the one night camping trip. Everyone rides out with Lynn from the equestrian trail head and travels about 15-17 miles in the park. During the ride Lynn shares his wealth of knowledge about the area and park staff give educational demonstrations along the way. Pack a sack lunch in your saddle bags to enjoy while taking a break at one of the demonstrations. The camp site is at the windmill. This is primitive camping, no bathroom/shower facilities, no electricity, etc… At the windmill there is a water source and trough for the horses, seven horse pens, one picnic table, a fire pit, hitching posts, and shade trees. At camp everyone enjoys a hot cooked meal, participants share Cowboy poetry, Lynn invites guests to play music, and star gazing is also an enjoyable evening activity. 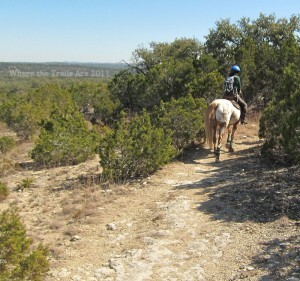 The next day after breakfast camp is cleaned up and everyone rides back to the trailhead (about eight miles) by way of the equestrian trails. If you would like to participate in this program then contact the park directly for details. 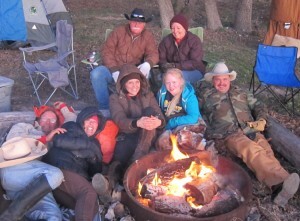 I had the pleasure of camping at the windmill site in February of 2012 through the Cowboys Under The Stars program. The group was small, totaling seven riders to include Lynn and his daughter, Kate. Possibly the predicted cold evening temperatures dwindle the group down a bit. During the ride Lynn talked about the park and it’s history. One of the bits of trivia he shared was the Spanish definition of Pedernales, pedro meaning rock and nales meaning flint, thus making it flint rock. We started out on the equestrian trail taking the Duck Lake Loop and passing the man made duck pond. We then headed off the marked equestrian trails and crossed the park road. Next we came to the sandy banks of the Pedernales just north east of the Pedernales River’s falls. This spot gave us a good view of the stair stepped limestone rocks making up the falls, one of the biggest attractions to the park. Lynn found a good spot to cross through the river. Everyone’s horse did great making their way through the clear water. Once over the river we followed it south to where it bends back to the east. There we left the river banks and headed north and then east to explore the newest acquired park property. From these trails you could see amazing overlooks of the park and falls. We returned to the river banks and crossed through the Pedernales once again. We followed Lynn southwest along the river banks to Trammel’s Crossing. I was surprised to see how much deep sand accumulated along the banks. All of Pedernales is beautiful but this stretch along the river took my breath away. Pedernales River’s crystal water, deep sandy beach banks, limestone boulders, and flora was the highlight for me. Lynn shared that some of the trails we rode will possibly be opened up to equestrians in the future, including some of the riverside trails! We then headed to the amphitheater where park staff member, Josh Helcel, showed us examples of plant life such as Ash Juniper, Agarita, Mustang Grapevine, Twisted Leaf Yucca, basket grass, and much more. He discussed with us current day uses of the plants and we learned how the Native Americans used the plans. We were able to sit down and enjoy our sack lunches during this presentation while our horses got a rest. From there we rode through some of the camping areas, south down the side of the park road for a short distance, and then continued southwest through some of the hike and bike trails. In one spot remnants of an old rock wall still remained, marking old boundary lines from previous ranch owners.We crossed over a few spring fed creeks and arrived at the windmill camp site. Once settled in camp, we enjoyed a scrumptious chicken and sausage gumbo prepared by Tommy, cowboy poetry readings, songs and guitar picking by park host Denny Standford, and good company by a warm fire. It got down to 35 degrees that night so we only stepped away from the fire briefly to gaze upon the Milky Way and the evening’s constellations. Several campers unrolled their sleeping bags near the warmth of the fire. I slept in my tent cot a little too far from the fire, it was very cold. The next morning I awoke to a bacon and egg taco breakfast with coffee wonderfully prepared by Tommy and Carol. We took our time enjoying breakfast and everyone’s company. Then we packed up and rode back to the trail head, about eight miles away. 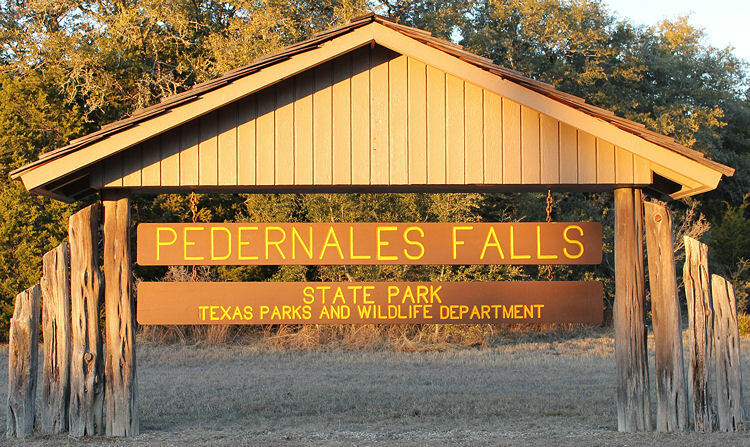 Pedernales Falls State Park, located in Blanco County about 35 miles west of Austin, contains over 5,000 acres of Texas Hill Country and offers approximately 16 miles of equestrian trails. The park is owned and managed by Texas Parks and Wildlife. In addition to equestrian trails the park also offers, hiking, biking, fishing, swimming, bird watching, and numerous opportunities for capturing picturesque views. The rugged thin soiled terrain will require your horse to have shoes, boots, or extremely tough healthy hooves. The majority of trails consist of limestone rock and rough ground, especially on the South Loop. There are a few dirt trails with more forgiving ground, but mostly the trails are rocky. The trails have easy grade increases with few steep or difficult spots. 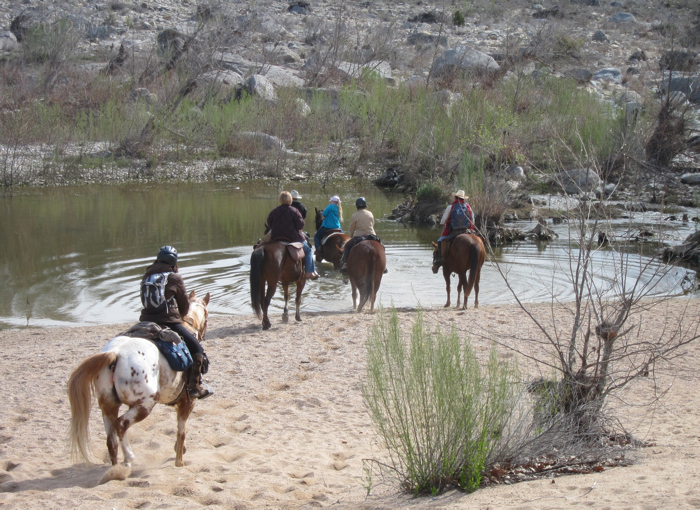 The equestrian trails do not provide access to or views of the Pedernales River at this time. When not suffering from a severe drought the equestrian trails provide watering opportunities by way of creeks and springs. On the most southern side of the South Loop just over five miles from the trail head is a windmill without blades. This is a great area to stop and water your horse, rest, and enjoy the countryside. This location provides a water trough, shaded picnic table, seven horse pens, and a few hitching posts. When traveling on the west side of the equestrian trails along the fence line note that the map makes it seem the trail always stays along the fence, however, it does veer off from the fence and then back again a few times. Here the tail has also been modified to prevent erosion, causing it to look almost like a pedestrian trail in some spots. The first time I came across this spot I thought I was off trail. Some horses might spook or sniff at the strange footing here. The trails are not well marked, but there are not many different trail, just four connecting loops (North, Duck Lake, Short, and South Loops). 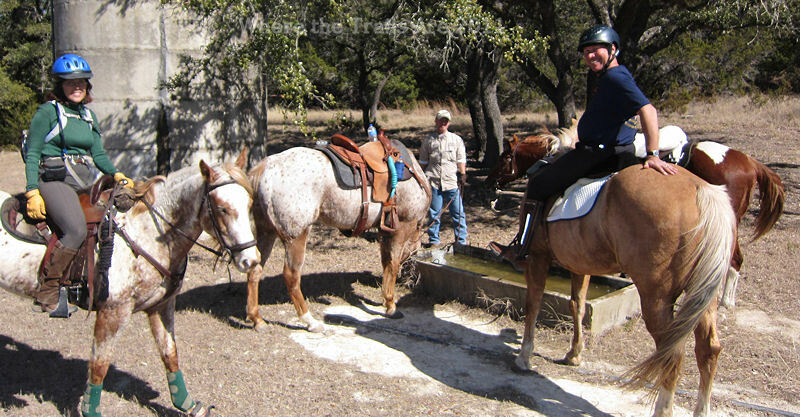 Angel and I enjoy riding at Pedernales Falls and she manages the rough terrain just fine, but I do have boots (Renegades) on her front hooves and she is barefoot on her hind. After a good ride Angel enjoys being hosing off at the wash rack, a nice drink of water from the trough, and some hay. She can then relax while I enjoy a snack at the picnic table with a nice group of fellow trail riders. 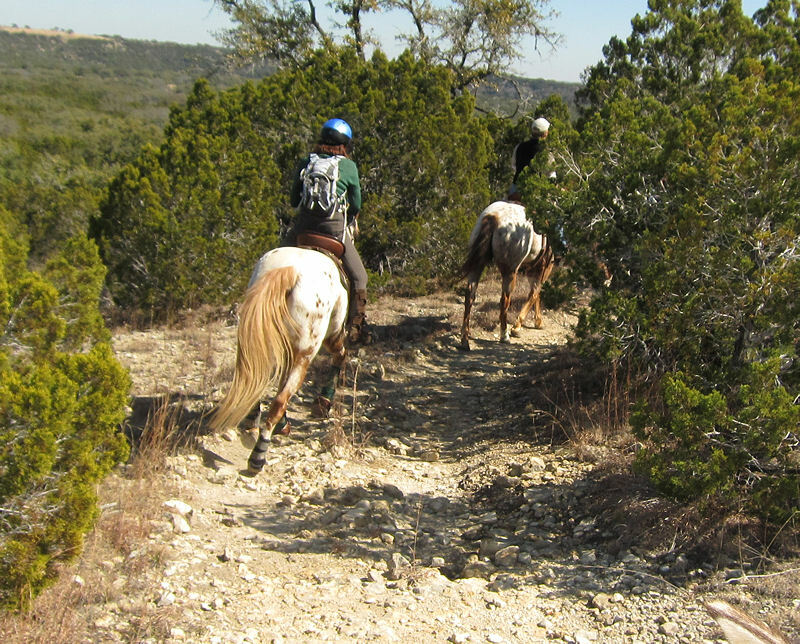 The equestrian trails at Pedernales Falls State Park provide an enjoyable ride and Hill Country views. You can help support this park by becoming a regular visitor, donating, volunteering, and informing park officials if they invest in additional equestrian trails it will pay off by increased equestrian visitors. Water trough and rest area at the southern end of the South Loop. Carol on her Appaloosa heads towards the South Loop.